OOPS August Paint Out set for August 28th in Richlands. Click HERE event link below for all the details about our August Paint Out at the William and Terry Fields property in Richlands. 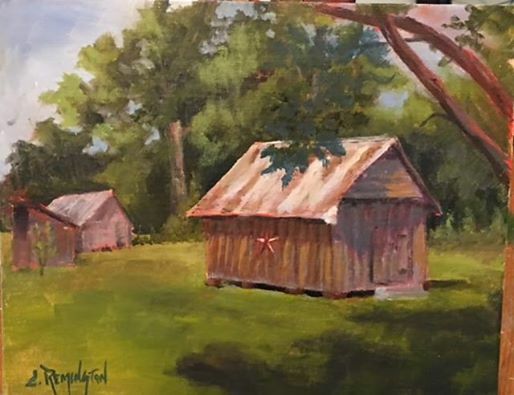 Dean Remington and Jim Phillips were out on a plein air trip recently and ended up knocking on the door of Mrs Terry Fields (a retired Onslow teacher) who very graciously allowed them to paint her old sheds, and barns around a beautifully maintained large yard.They mentioned our OOPS group possibly coming there to paint and she graciously accepted. She is very excited about having the OOPS group on the 28th of Aug. For those who have GPS devices the name and address is William and Terry Fields at 266 Fowler Manning Rd. Richlands, NC. Below are paintings by Jim Phillips and Dean Remington done on location at the Field's prpoerty. CALL to OOPS ARTISTS... We are being featured in My Onlsow Magazine and need to gather for a Paint Out/Photo Shoot this Friday (August 5th) at the Eagle, Globe and Anchor Monument (near the Beirut Memorial) at 2 pm. If you painted there during our May Paint Out... please bring your finished painting (gives me a good excuse to finish mine). If you didn't attend... here's your chance to paint at this awesome site. Bring gear ready to paint... or at least pretend to paint if you can't stay long. OOPS August Paint Out ~ August 28th ~ Waiting on confirmation of location but go ahead and SAVE the date! September Paint Out ~ Sept. 23 - 25, 2016 ~ "From Sound to Sea Paint Out 2016"
"From Sound to Sea Paint Out 2016"
905 Ocean Drive, Emerald Isle, NC. Pick up name tags, maps with paint locations and restaurant guide. * To compete for peoples choice award have your canvases stamped this night! Saturday, 9/24/2016: Paint all day between the Sound and the Sea. 6402 Cove Road,Emerald Isle, NC. Sunday, 9/25/2016: Paint till set up for “Art Show and Sale”. Time: 3:00pm – 5:00pm, at “The Trading Post” restaurant patio area, 8302 Emerald Drive, Emerald Isle, NC 28594. There will be a Peoples choice award for paintings painted during the event of $150.00. Location Description: Emerald Isle is a barrier Island of the coast of North Carolina. On one side you will find Ocean views, sea oats, sand fence, water birds, beach houses and clouds over the water. On the sound side there are many vistas of the sound, small islands, docks, boats, birds and the mainland in the distance. Photos, Info, & more - Ask to join. Order OOPS T-shirts, totes, stickers, etc., safe and secure online through Redbubble. Get the latest news from OOPS! Subscribe to OOPS! by Email ......... What the heck is OOPS and how do I join the FUN? The Onslow Outdoor Painters Society (OOPS!) 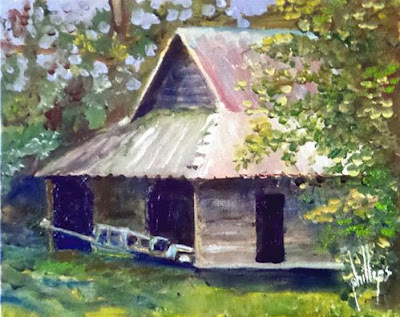 is a gathering of artists from Onslow County, North Carolina, with one purpose... carrying on the tradition of painting "En Plein Aire"... a French term literally translated "In Open Air". We have no officers, no membership dues, no by-laws, etc... we simply gather on appointed dates for "paint outs" enjoying the fellowship of like minded individuals sharing the same passion... plein air painting. Pronouced plen air... literally means “in the open air"
No Robert's Rule of Order! So when do we meet? We gather at "Paint Outs"... date and location (within the county) predetermined where we simply fellowship and PAINT! "Paint Outs" occur approx. once a month. Plein Air Artists ~ Online Forum and more! Email subscription gives you all the latest plein air news, events, workshops, artwork, plein air demos and tutorials, info on "Paint Outs", and more from the Onslow Outdoor Painters Society (OOPS)... subscribe today!